Random digit dialing: After inputing the correct prefixes for cell numbers in Zimbabwe (71, 73, and 77) a machine can dial random phone numbers. This makes it easy to replace any disconnected or unused numbers with the next random phone number. Sample frame from the Telecoms: After partnering with the three major providers in Zimbabwe (Econet, Telecel, and Net*One), a list can be compiled of the numbers that have been active in the past 30 days from which to randomly sample. However, with many users changing SIM cards as they travel, or to take advantage of better rates, the list of active lines may include some that belong to the same person. To compensate for a survey that does not perfectly represent the entire country of Zimbabwe, weights can be added to response groups in order to match the proportions known in the population. As an example, oversampling Sindebele speakers (who are only around 15%) or urban residents (5 million of the 13 million in the country) could be reproportioned to compenstate. This would not help if the sample itself is unrepresentative, but for the purposes of this project, the sample of mobile users is assumed to be the best representative sample that can be achieved. To make sure that the survey was successful it would need at least one round of testing (a pilot program) to flesh out the right wording of the questions and the right incentive for response. Usually this is done by running the survey twice with only one difference in the implementation. One group could be asked about their ethnicity or language, and the other would not, in order to see if the overall response rate dropped because people were put off by the question. Other pilots could test the level of incentive needed to ensure a high response rate. Does 25c of airtime make it worth someone’s time? Finally, what information people are told about the survey before they participate will be crucial to gauge. While Americans are used to pollsters calling for their opinion and assume that their anonymity will be protected, this can not be said around the world. Does a public campaign need to be undertaken? Can a SMS with a url link to a website do the trick? Understanding what information is needed by those surveyed to have enough trust in order to respond will be one of the most crucial steps taken. With these factors in mind, the formation of a mobile-based public opinion survey in Zimbabwe could be begun. Generalizability will be a crucial component for this survey as it’s likely to be one of the most critiqued factors. Those that respond to the survey could be less fearful that their answers might offend the security regime, and thus more likely to be ZANU-PF supporters. Conversely, those that do not own mobile phones are more likely to be poor and rural citizens, and are a group that ZANU-PF has consistently targeted for electoral support. These plus other factors need to be overcome by the structure of the final form of the survey in order to produce a non-response rate of less than 30%. Any more and there’s no chance of generalizing about the voting habits of the Zimbabwean populace. Despite fine tuning the sample frame, correctly weighting the demographics, or identifying the right incentive, Zimbabweans may still be resistant to mobile polling. If the risks perceived by a voter in revealing their political preference cannot be assuaged by those conducting the survey, then high measurement error will likely result. Despite the challenges and difficulties in achieving a proper survey, there is a clear social benefit provided to the Zimbabwean people. Polling allows a population to give instant feedback to political parties and candidates during elections. While the United States has become obsessed with polling to the point of superfluousness, citizens are able to indicate their preferences at various times, rather than just through a one-off election. Additionally, election monitors can use the trends of polling to provide a more accurate assessment of whether elections have been rigged or manipulated. If monitors know that Province A had been trending support of 60% for candidate A but in the election candidate B receives 70% of the vote, a red flag can be triggered and thus alert monitors to further investigate the results. Without knowing pre-election opinions, no one can be certain if the populace truly voted the way they did. Democracy is at a standstill in Africa despite recent headlines. Technology will not be a democratizing agent on its own. However, if used in certain circumstances to improve accountability, transparency, or connectivity, we should embrace the chance help consolidate existing republics as well as bringing forth more democratic regimes in Africa. an element of a culture or system of behavior that may be considered to bepassed from one individual to another by nongenetic means, esp.imitation. This is a critical piece of the public diplomats’ toolkit because their tasks are to disseminate ideas and values that represent their nations, employers, or clients. This is not an easy task, and it is made all the more difficult by the difficulty of measuring the success or failure of memes. How well do people associate Nike with great athletics? How well do people in Africa associate democracy and civil rights with the United States? Does China’s articulation of a ‘peaceful rise’ achieve the geo-strategic goals in their foreign policy? These answers are a bit ephemeral because of the shifting perceptions, and are often only analyzed in retrospect, or when the public can subconsciously agree as a ‘whole’ that a certain meme is associated with a certain brand, country, or person. 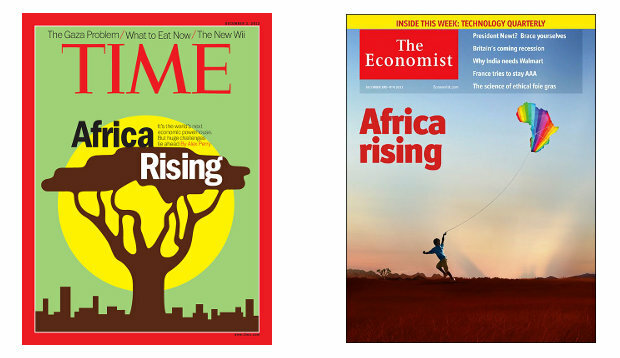 Recently, there have been many newspapers (The Economist), magazines (Time), and writers who have hailed the ‘Rise of Africa’ in the past decade. These analyses often look at the massive growth rates in GDP that African countries have sustained and they see hope for the future, especially when contrasted with the stagnant or non-existent growth in North American or Europe. This meme has been credited with increasing the focus on Sub-Saharan Africa both in the business community as well within the foreign policy community. The measures of development (GDP, consumption, and trade) are wrong. It is a claim that goes against 50 years of development work, and may in fact be a needed critique to development studies. However, Rowden doesn’t go down the path of most who attack GDP and other monetary based measures do. He could have explored the Better Life Index, the Green GDP, or simply argued that GDP and its like can’t possibly ascertain Africa’s geo-political position and whether the continent has grown more powerful in international relations. No, Rowden instead says that industrialization is the primary way to measure growth. And his rationale? Because all the other countries who grew first (the West),first industrialized in their development stages. This cross temporal comparison is shocking, because it basically makes the argument that there is only one way to growth a national economy! Which contradicts his argument against the use of neo-liberal economic markers (GDP per capita, consumption, and trade) to measure growth!